Crowdfunding campaigns are a dime a dozen, but every once in a while, something truly exciting comes along that takes the internet by storm. That’s exactly what happened earlier this week, when Austin, TX–based startup Into Solutions Inc. launched what very quickly became the most successful Kickstarter campaign of all time. The product? A Scream mask that has a mouth slit so you can still eat chicken tenders while wearing it. Within an hour of going live, the campaign for the chicken-accommodating horror mask had already soared past its $1 million goal, and in less than two days, it has managed to rake in over $22 million from more than 70,000 individual backers—easily taking the record for the highest-funded project in Kickstarter’s history! Though the Kickstarter has barely gone live, demand is already overwhelming supply, and a recent campaign update cautions that, due to manufacturing limitations, new backers might not receive their masks until months down the road. 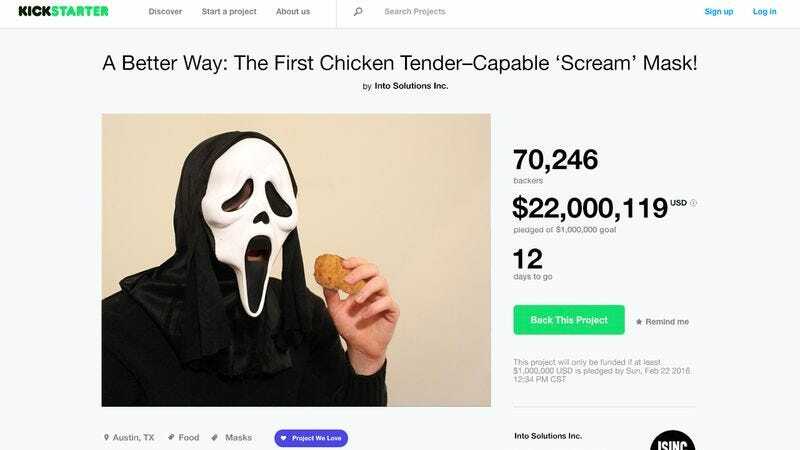 However, donations have hardly slowed, as consumers are clearly extremely excited at the prospect of finally being able to keep their Scream mask on when it’s time to eat meat. How many of these incredible new Scream masks do you think you’ll buy? Tweet/Facebook us and let us know!